Tenolysis is absolutely contraindicated in patients with active infection, motor-tendon problems secondary to denervation, and unstable underlying fractures requiring fixation and immobilization. Relative contraindications include extensive adhesions, immature previous scars, and severe posttraumatic underlining arthrosis. 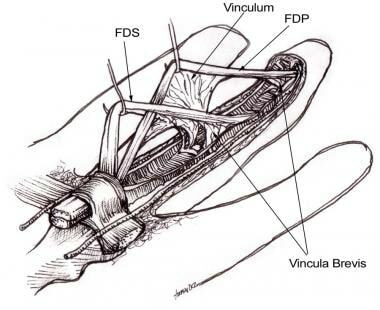 Two tendons contribute to active flexion of a finger: the tendon from the flexor digitorum profundus (FDP) muscle and the tendon from the flexor digitorum superficialis (FDS) muscle (see the image below). Both tendons attach to each finger. Both are enclosed within an enclosed tendon sheath called a theca. The tendons connect the muscle bodies in the forearm with the fingers in the hand, passing through the carpal tunnel at the wrist. Flexor tendons with attached vincula. FDS, flexor digitorum superficialis; FDP, flexor digitorum profundus. Tendons from the FDS insert on the base of the middle phalanx of each finger to flex the finger at the metacarpophalangeal (MCP) and PIP joints. The FDP inserts into the base of the distal phalanx and flexes the finger at the MCP, PIP, and distal interphalangeal (DIP) joints. Not all fingers are capable of independent movement in every individual, because the tendons from the FDP are usually connected proximal to the individual fingers, the only common exception being the tendon to the index finger. An elaborate system of pulleys is in place to prevent “bowstringing” or elevation of the tendon away from the palmar surface of the wrist during active flexion. The tough membrane that prevents this at the wrist is called the flexor retinaculum of the hand, and the tunnel for the tendons beneath is called the carpal tunnel. At the fingers, there are various annular or cruciate ligaments that perform a similar task by preventing the tendons from elevating. The precise number of annular or cruciate ligaments in each finger can potentially vary from individual to individual, but commonly, there are three or four cruciate (C1-C4 proximal to distal) and four or five annular (A1-A5 proximal to distal) ligaments. The first annular pulley, A1, lies at the head of the metacarpal bones, whereas the second through fifth annular ligaments, A2-A5, all attach to the bones on the finger. The cruciate ligaments generally are smaller than annular ligaments and are found between annular ligaments. Together, the cruciate and annular ligaments make a tunnel through which normally the flexor tendons pass. Breton et al evaluated the increase in active ROM and the incidence of complications in 60 patients (75 fingers) who underwent flexor tenolysis in zone 2, with or without dorsal tenolysis or PIP arthrolysis. The mean increase in total active motion for patients undergoing tenolysis only was 60°, compared with 90° in those undergoing tenolysis with arthrolysis. At 6 weeks, 23% of cases had excellent functional outcomes, 47% had good outcomes, 20% had average outcomes, and 10% had poor outcomes. Derby BM, Wilhelmi BJ, Zook EG, Neumeister MW. Flexor tendon reconstruction. Clin Plast Surg. 2011 Oct. 38(4):607-19. [Medline]. Azari KK, Meals RA. Flexor tenolysis. Hand Clin. 2005 May. 21(2):211-7. [Medline]. Eggli S, Dietsche A, Eggli S, Vögelin E. Tenolysis after combined digital injuries in zone II. Ann Plast Surg. 2005 Sep. 55(3):266-71. [Medline]. Wong JK, Lui YH, Kapacee Z, Kadler KE, Ferguson MW, McGrouther DA. The cellular biology of flexor tendon adhesion formation: an old problem in a new paradigm. Am J Pathol. 2009 Nov. 175(5):1938-51. [Medline]. Potenza AD. Critical evaluation of flexor-tendon healing and adhesion formation within artificial digital sheaths. J Bone Joint Surg Am. 1963 Sep. 45:1217-33. [Medline]. Matthews P, Richards H. Factors in the adherence of flexor tendon after repair: an experimental study in the rabbit. J Bone Joint Surg Br. 1976 May. 58(2):230-6. [Medline]. Lindsay WK, Thomson HG. Digital flexor tendons: an experimental study. Part I. The significance of each component of the flexor mechanismhin tendon healing. Br J Plast Surg. 1960 Jan. 12:289-316. [Medline]. Lindsay WK, Thomson HG, Walker FG. Digital flexor tendons: an experimental study. Part II. The significance of a gap occurring at the line of suture. Br J Plast Surg. 1960 Apr. 3:1-9. [Medline]. Dy CJ, Daluiski A, Do HT, Hernandez-Soria A, Marx R, Lyman S. The epidemiology of reoperation after flexor tendon repair. J Hand Surg Am. 2012 May. 37(5):919-24. [Medline]. Breton A, Jager T, Dap F, Dautel G. Effectiveness of flexor tenolysis in zone II: A retrospective series of 40 patients at 3 months postoperatively. Chir Main. 2015 Jun. 34 (3):126-33. [Medline]. Drapé JL, Silbermann-Hoffman O, Houvet P, Dubert T, Thivet A, Benmelha Z. Complications of flexor tendon repair in the hand: MR imaging assessment. Radiology. 1996 Jan. 198(1):219-24. [Medline]. Corduff N, Jones R, Ball J. The role of ultrasound in the management of zone 1 flexor tendon injuries. J Hand Surg Br. 1994 Feb. 19(1):76-80. [Medline]. McGeorge DD, McGeorge S. Diagnostic medical ultrasound in the management of hand injuries. J Hand Surg Br. 1990 May. 15(2):256-61. [Medline]. Hunter JM, Schneider LH, Dumont J, Erickson JC 3rd. A dynamic approach to problems of hand function using local anesthesia supplemented by intravenous fentanyl-droperidol. Clin Orthop Relat Res. 1974 Oct. (104):112-5. [Medline]. Whitaker JH, Strickland JW, Ellis RK. The role of flexor tenolysis in the palm and digits. J Hand Surg Am. 1977 Nov. 2(6):462-70. [Medline]. Caulfield RH, Maleki-Tabrizi A, Patel H, Coldham F, Mee S, Nanchahal J. Comparison of zones 1 to 4 flexor tendon repairs using absorbable and unabsorbable four-strand core sutures. J Hand Surg Eur Vol. 2008 Aug. 33(4):412-7. [Medline]. Walcher K, von Lüdinghausen M, Kuzmany J, Matzen KA, Küsswetter W. [Experimental "hormonal tenolysis" by cortisone therapy (author's transl)]. Arch Orthop Unfallchir. 1976 Feb 26. 84(1):1-12. [Medline]. Wrenn RN, Goldner JL, Markee JL. An experimental study of the effect of cortisone on the healing process and tensile strength of tendons. J Bone Joint Surg Am. 1954 Jun. 36-A(3):588-601. [Medline]. Karakurum G, Buyukbebeci O, Kalender M, Gulec A. Seprafilm interposition for preventing adhesion formation after tenolysis. An experimental study on the chicken flexor tendons. J Surg Res. 2003 Aug. 113(2):195-200. [Medline]. Kuo SM, Chang SJ, Wang HY, Tang SC, Yang SW. Evaluation of the ability of xanthan gum/gellan gum/hyaluronan hydrogel membranes to prevent the adhesion of postrepaired tendons. Carbohydr Polym. 2014 Dec 19. 114:230-7. [Medline]. Chou PY, Chen SH, Chen CH, Chen SH, Fong YT, Chen JP. Thermo-responsive in-situ forming hydrogels as barriers to prevent post-operative peritendinous adhesion. Acta Biomater. 2017 Nov. 63:85-95. [Medline]. Feldscher SB, Schneider LH. Flexor tenolysis. Hand Surg. 2002 Jul. 7(1):61-74. [Medline]. Schneider LH. Tenolysis and capsulectomy after hand fractures. Clin Orthop Relat Res. 1996 Jun. (327):72-8. [Medline]. Strickland JW. Flexor tenolysis. Hand Clin. 1985 Feb. 1(1):121-32. [Medline]. Constantinescu MA, Greenwald DP, Amarante MT, Nishioka NS, May JW Jr. Effects of laser versus scalpel tenolysis in the rabbit flexor tendon. Plast Reconstr Surg. 1996 Mar. 97(3):595-601. [Medline]. Turner JB, Corazzini RL, Butler TJ, Garlick DS, Rinker BD. Evaluating adhesion reduction efficacy of type I/III collagen membrane and collagen-GAG resorbable matrix in primary flexor tendon repair in a chicken model. Hand (N Y). 2015 Sep. 10 (3):482-8. [Medline]. Foucher G, Lenoble E, Ben Youssef K, Sammut D. A post-operative regime after digital flexor tenolysis. A series of 72 patients. J Hand Surg Br. 1993 Feb. 18(1):35-40. [Medline]. Strickland JW. Flexor tendon injuries. Part 5. Flexor tenolysis, rehabilitation and results. Orthop Rev. 1987 Mar. 16(3):137-53. [Medline]. Strickland JW. Flexor tendon injuries. Part 2. Flexor tendon repair. Orthop Rev. 1986 Nov. 15(11):701-21. [Medline]. Wiig ME, Dahlin LB, Fridén J, Hagberg L, Larsen SE, Wiklund K, et al. PXL01 in sodium hyaluronate for improvement of hand recovery after flexor tendon repair surgery: randomized controlled trial. PLoS One. 2014. 9 (10):e110735. [Medline]. [Full Text]. Branford OA, Klass BR, Grobbelaar AO, Rolfe KJ. The growth factors involved in flexor tendon repair and adhesion formation. J Hand Surg Eur Vol. 2014 Jan. 39 (1):60-70. [Medline]. [Full Text].